Chives are an easy to grow, hardy perennial herb that will reward you with attractive edible green foliage and colorful blossoms each year. Chives are a versatile and delicious way to flavor many dishes. Here are tips for growing chives. Chives are an herbaceous perennial species in the lily family (Liliaceae) and are related to onion, leeks and garlic. Chives grow in an upright clump of hollow leaves that reach about a foot high. In summer, the plants send up pretty blossoms. All parts of the chive plant are edible. Chives sprout from bulbs beneath the soil. 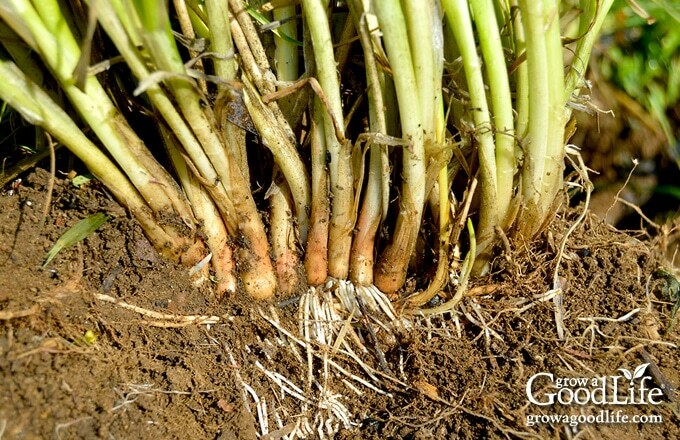 Over time, the bulb splits and forms new bulbs, eventually creating a larger clump of chives. The plant’s foliage dies back each fall, and the bulbs beneath the soil go dormant. Once warmer weather arrives in spring, the bulbs begin sending up new green spiky foliage. You can grow chives in a clump, or place several plants in a row to make an attractive edging to your garden. Chives even make an pretty container plant for your porch or patio. Two popular subspecies of chives are common chives and garlic chives. Their growing conditions are similar. Common chives (Allium schoenoprasum): Common chives have a mild onion flavor. The plant features thin, hollow, dark green foliage that grows in a dense clump up to 12 inches high. Flower clusters bloom on stems that rise above the foliage in late spring through early summer. Garlic chives (Allium tuberosum): Additionally called Chinese chives, geisha garlic chives, Chinese leeks, and gow choy have a slight onion-garlic flavor. The foliage is thin, flat leaves that grows in a clump up to 15 inches high. Blossoms are white star-shaped florets that bloom in late summer and early fall. Chives are attractive: Chives are a striking addition to flower, herb, and vegetable gardens with their spiky dark green foliage and bright lavender blossoms. Chives are edible: All parts of the chive plant are edible. The chive’s green foliage has a mild onion flavor making them a great addition to salads, scrambled eggs, and as a garnish. The purple blossoms are a colorful edible decoration that adds a light onion flavor. Even the small bulbs can be used in any recipe that calls for green onions or scallions. 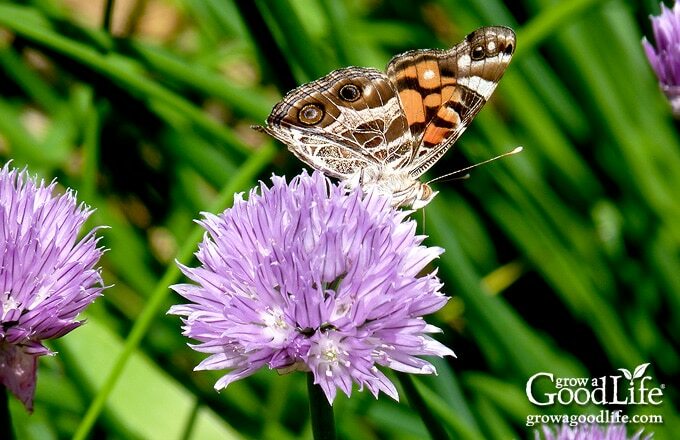 Chives attract pollinators: The flowers bloom mid spring to early summer, right around the same time the summer crops are just beginning to flourish. The fragrance and color of chives attract many bees, butterflies, wasps, hornets, and other pollinators to your garden. Chives repel pests: Since chives are related to onions, their pungent fragrance is a natural pest repellant. Chives discourage carrot flies, aphids, beetles, and cabbageworms. 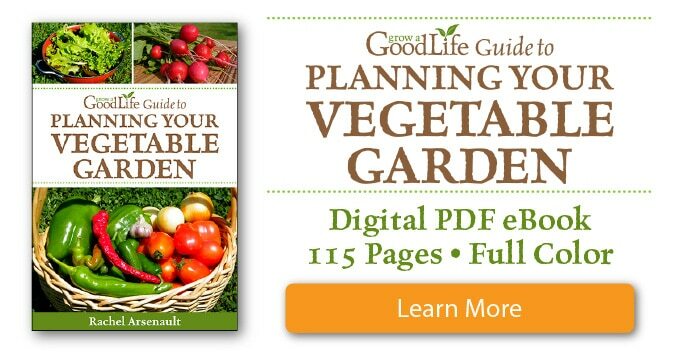 Plant a few clumps of chives as companion plants with carrots, tomatoes, and any crop in the cabbage family. Also plant a few clumps around your cucumber and squash crops to repel cucumber beetles. Additionally, consider chives as companion to your roses to help deter black spot. Plant around fruit trees to repel borers and apple scab. Chives are perennials: Chives grow as perennials in US plant hardiness zones 3-9. Plant chives once and they will come back every year. 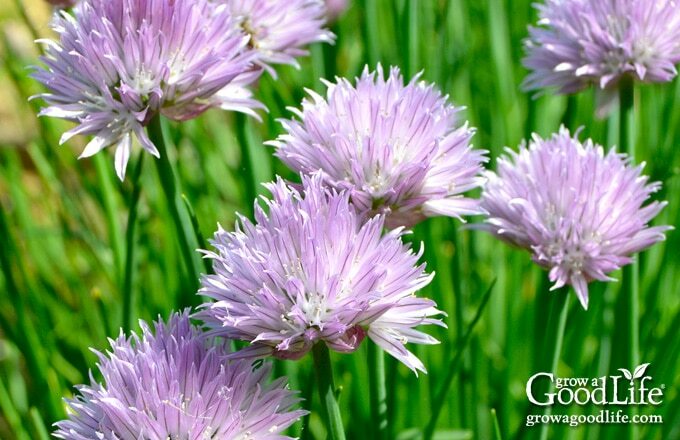 Chives self sows easily: Leave the blossoms on the plant and they will shake out their seeds. You’ll find the spiky foliage growing come summer. Simply dig them up and replant elsewhere. Chives are easy to propagate: Chive bulbs can be divided from the mother plant and replanted easily. Chives are the first to appear in the spring garden: Chives are one of the first green to appear in the garden…a welcomed sight after a long winter. 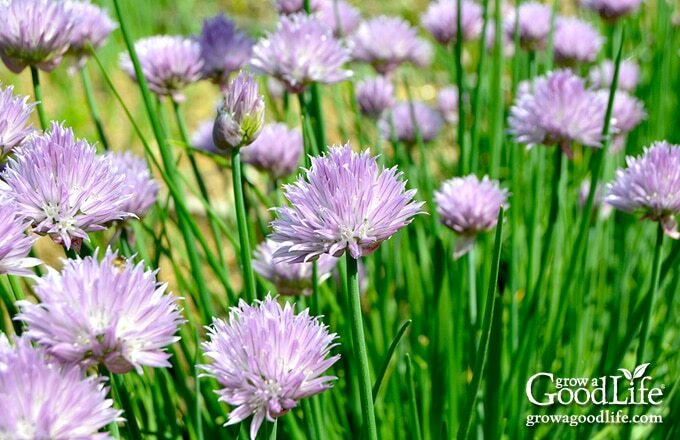 Chives are drought tolerant: Established chive plants can handle low moisture conditions. Chives are versatile and make a great addition to your herb and vegetable garden. They can also be incorporated in your flower garden as the attractive foliage and blossoms blend in well with other ornamentals. Chives are easy to grow from seed. Like most perennials, chives will take a year to produce a clump large enough for harvesting. 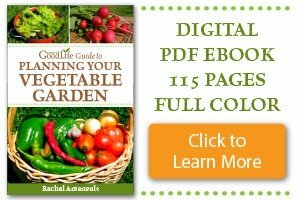 If you don’t mind the wait, you can start seeds early under lights and then transplant into the garden in spring. Sow seeds 6-8 weeks before your last spring frost date (look yours up here by zip code) or sow outside as soon as the ground can be worked. It will take 10-20 days for the seeds to germinate. Chives grow in clumps, so there is no need for thinning. Harden-off your seedlings to allow them to adjust to being outside, and transplant into the garden after all danger of frost has passed. Choose a permanent spot to grow your chives. Chives grow well in full sun, but will also grow in partial shade although they may not bloom as strongly. Since they are perennial, chives come back every year, and the clump will spread slightly each time. Allow plenty of space for an easy crop year after year. Chives are tolerant of a wide variety of soils but will grow best in rich, well-drained soil. Mix a generous amount of compost and a slow-release, all-purpose fertilizer into the soil before planting. If the weather has been dry, water the bed thoroughly the day before you transplant. Whether you grow your own chive transplants, buy seedlings from a nursery, or plant a clump given to you by a friend, be sure to harden off your seedlings before transplanting. Select an overcast day to transplant your chive seedlings. Water your plants well to help the roots stay together and prevent damage when transplanted. Dig holes large enough to contain the entire root system comfortably and to set the crown about 1/2-inches below the soil surface. Water the hole thoroughly, and then let the water drain. Space plants about 8 to 12-inches apart. If you grew your chive seedlings in soil blocks, place the block into the hole and gently firm the soil around the seedling, If your seedlings are in containers, carefully remove the root ball from the container, place it into the hole, and lightly firm the soil. Water well to remove air pockets. Mulch to conserve moisture and keep the weeds down. Water frequently when the chive plants are young, and then reduce waterings. Allow new plants to become established for the first year by harvesting sparingly. When you are ready to harvest the foliage, select leaves from the outside of the clump and cut 2 inches from the soil. 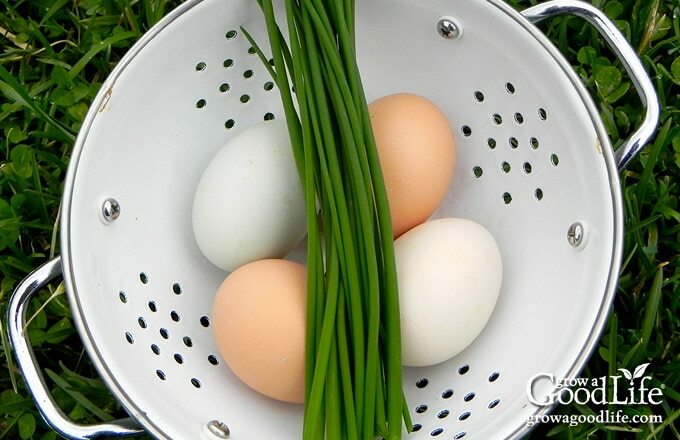 Chop and add fresh chives to scrambled eggs, salads, soups, and stir-fry. Use as a pizza-topping, sprinkle on a baked potato, or scatter on a bagel with cream cheese. Chive blossoms are also edible and have a light onion flavor. Snip off the blossoms when they open fully. Use the blossoms as an edible garnish, add the flowers to scrambled eggs, or sprinkle them in a green salad. Infuse the chive blossoms in vinegar for a subtle onion flavor and a pretty purple blush of color. Chives don’t need a lot of care, are not bothered by many pests, and are not fussy about the quality of soil they are growing in. They continue to thrive even in drought situations. Water if the conditions are very dry and the tips of the foliage begin turning brown. After the blossoms have faded, trim the chive plants the chive plants down to about 6-inches. Soon your plants will push out a fresh flush of spiky foliage that will provide you with plenty of harvests well into fall. As winter approaches, the chive plants will go dormant and wait for the spring soil to thaw so they can emerge once again. Add a layer of finished compost around the plant each spring and mulch to keep down weeds. Chive bulbs multiply over time. To keep plants healthy and from becoming overcrowded, divide plants every 3 years. You can divide established chive plants in early spring or fall. Simply dig up the clump of bulbs, separate them into individual small clusters of bulbs, and replant. If you are dividing in fall, consider potting up a clump to grow indoors for winter. 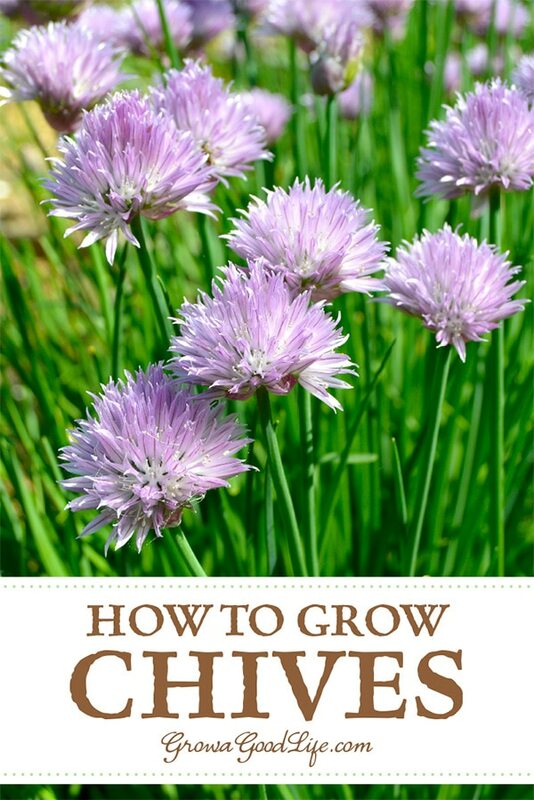 Do you grow chives? What tips do you have to share? Lauren, That is such a wonderful memory. I bet you smile every time you see chive blossoms. My mom and now I have had 3. Clumps of.chives always. Every week we chop one to about 2″ from the root. Never let it flower or you will have them everywhere! If you cut back just one.cLump evrryweek you will have greens to eat all the time. Great tip, Megan! Thanks for sharing.